Wholesale Distributor of a wide range of products which include roll to roll lamination machine with steel roller. We manufacture and supply Roll to Roll Lamination Machine which laminates various types of materials like Plastic, Paper, LDPE, BOPP, etc. from Ahmadabad, Gujarat, India. We have been successfully manufacturing, exporting & supplying all types of Lamination Machin. 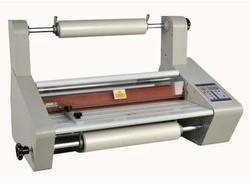 Looking for Document Laminators ?